Offers up a compelling slice of both feminist and Industrial Age history --"Christian Science Monitor"
From the "New York Times" bestselling author ofTHE DRESSMAKER comes a moving historical novel about a bold young woman drawn to the looms of Lowell, Massachusetts--and to the one man with whom she has no business falling in love. Eager to escape life on her family's farm, Alice Barrow moves to Lowell in 1832 and throws herself into the hard work demanded of the mill girls. In spite of the long hours, she discovers a vibrant new life and a true friend a saucy, strong-willed girl name Lovey Cornell. But conditions at the factory become increasingly dangerous, and Alice finds the courage to represent the workers and their grievances.Although mill owner, Hiram Fiske, pays no heed, Alice attracts the attention of his eldest son, the handsome and reserved Samuel Fiske. Their mutual attraction is intense, tempting Alice to dream of a different future for herself. This dream is shattered when Lovey is found strangled to death. A sensational trial follows, bringing all the unrest that's brewing to the surface. Alice finds herself torn between her commitment to the girls in the mill and her blossoming relationship with Samuel.Based on the actual murder of a mill girl and the subsequent trial in 1833, THE DARING LADIES OF LOWELL brilliantly captures a transitional moment in America's history while also exploring the complex nature of love, loyalty, and the enduring power of friendship. Kate Alcott is a journalist who has covered politics in Washington, DC, where she currently lives. "Both inspiring and thought-provoking. Ms. Alcott’s interweaving themes of strength, courage, love, loss and betrayal will keep the reader captivated for hours"
"Set against an authentically detailed mill-town backdrop, this novel interweaves the industrial ­revolution, feminism, and workers’ rights into an engrossing narrative with a love story at its core." 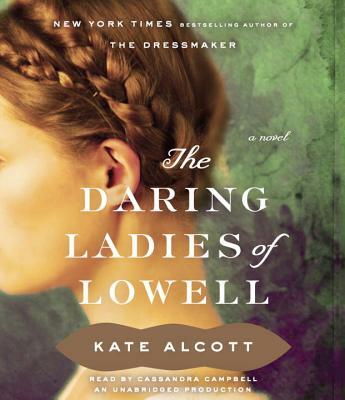 "Rendered in vivid, authentic period detail, The Daring Ladies of Lowell is a suspenseful, compelling tale of courageous young women fighting for justice—and sometimes their very lives—in the cotton mills of mid-nineteenth century Massachusetts."